Retreating can be the space needed for introspection, reflection, and re-connection in order to come back to our daily lives with more attention and intention. Join Shayah Muller from Yoga with Shayah and Kelly Edwards from Happy Rock Holistics for a 6 day / 5 night women's only wellness retreat, the perfect setting for those who want to take a break from a busy lifestyle, reboot their body, reconnect with nature, learn how to jump start or sustain a healthy lifestyle, all while being surrounded by a sisterhood of like-minded women in a tropical forest and the pristine healing waters of the beautiful crater lagoon. This is a healthy, "feel good", all-inclusive women's only retreat including yoga, meditation, crystal healing, nature hikes, and evening bonfires! Outside of the planned activities, enjoy relaxing on-site or take an excursion to some of the wonders nearby. You can also book a massage with Kelly or a nutritional consultation with Shayah. 5 nights shared or private accommodation in one of the Lake View Suites, Lake View Rooms or Forest Rooms with private bathrooms and hot water. Three plant-based meals per day. Unlimited juices and smoothies from the Healthy Bar. Unlimited herbal tea, bananas, lime water and fresh coconut water. Yoga and meditation classes twice daily with Shayah - suitable for all levels. A half day tour visiting the town of Masaya: explore the local artisan markets followed by a hike through Masaya Volcano National Park where you can take a peak inside an active volcano! Plenty of time to relax, journal, reflect, and set new health and wellness goals based on your lifestyle with guidance from Shayah and/or Kelly. Included in your accommodation cost: All natural, chemical-free toiletry products (hand soap, gel, shampoo and conditioner made locally), daily maid service and unlimited wifi. Flights to/from Nicaragua (fly into Managua Airport, MGA). Additional services or tours not included above. Shayah is a yoga and meditation teacher as well as a registered holistic nutritionist with a passion for preventative health and wellness. Yoga, world travel and transitioning to a plant-based diet have been key factors in her own personal growth and development which she now loves sharing with others. After spending years working in administration and feeling burnt-out, stressed-out, and unfulfilled, she is now committed to bettering the lives of her students and clients both physically and spiritually, while empowering them to live in alignment with their values. She accomplishes this by helping people bring the teachings of yoga off the mat and into their daily lives. Kelly Edwards, mama of two girls, ages two, and five. Owner of Happy Rock Holistics. Kelly has been devoting her time learning how to encourage healing pain in the body associated with migraines, sciatica, and other common ailments. Specializing with deep tissue massage, hot stones, crystals, and positive intentions. Happy Rock Holistics has an entire product line sold locally and online, devoted to treating eczema, acne, and other symptoms. Freshly made products are handmade, and created with raw and organic ingredients. Kelly loves holding DIY workshops, meditations, oracle cards, singing bowls, and holding space for community around new moons, and raising vibrations on this earth. .
... Overweight or simply living in a body that you don't recognize as yours? ... Suffering from brain fog? Skin problems? Bloating and/or digestive complications? Crazy sugar cravings? Emotional eating episodes? If your answer is YES to any of these questions, we have the perfect escape for you this winter! Join Miriam RM, Health and Lifestyle Coach and Co-Owner of Apoyo Lodge for this year’s SUMMER DETOX CAMP to take control of your health and give your system the "reset" it needs. We are offering you the opportunity to join a limited amount of determined participants who will embark on a guided, 7 night detox journey to help their bodies get back on track and enhance their natural elimination and cleansing mechanisms. Your body is so wise, you wouldn’t believe it! It was designed to keep itself clean and healthy by just following our natural instincts. Detoxing has played a crucial role in human history across most cultures and religions, it is not just a trendy thing for celebrities to do these days. Unfortunately, most of today's western lifestyles don't support the body's mission of getting rid of the junk it no longer needs. Instead, most people overload their systems with damaging chemicals, toxins and fake foods/drinks with low nutritional value on a daily basis, which adds an incredible amount of work to your cleansing organs. When your body is not eliminating waste properly, chronic health problems, fatigue or unwanted extra pounds will irremediably become part of your life. What can you do about it? Don't worry, this is what we are here for: our Detox Camps are designed to help you jump-start a holistic cleansing process and provide you with the tools you need to continue this journey on your own when you get back home. It is not rocket science, but you need to know where to start, right? Eat the right food and drink the right fluids: a combination of fresh juices, filling smoothies and hearty soups to nourish your body whilst giving it a chance to do some much needed internal cleansing. In between you will be drinking coconut water and herbal teas that support liver, gallbladder and kidney detoxification. Plenty of water of course! Learn the basics of keeping your body healthy and clean during informative workshops and activities. Healing the body does not happen overnight, but it needs to start somewhere… and where could it be better than by the shore of a natural crater lagoon that is known for its medicinal healing waters in the company of a group of like-minded individuals? 7 nights shared or private accommodation in one of our boutique rooms with private bathrooms. All plant-based raw meals, smoothies, juices and soups as per the Detox Plan. Unlimited herbal tea, fresh lime, cucumber and coconut water. Workshops focused specifically on detoxification and elimination, juice cleanses, and all the information you need to make long-lasting positive changes to your lifestyle when you get back home. Mild Colon Cleanse with natural herbs. 2 x 60’ massages (possibility of more massage therapy throughout the week at an additional cost). Flights to and from Nicaragua (fly to Managua airport, MGA). Additional services not mentioned above. An initial non-refundable deposit of $300 USD is required to secure your reservation for this retreat. Payment can be made to Apoyo Lodge in the form of Paypal or by debit/credit card for an addtional 4% fee. The remaining balance will be due one week before arrival or when the retreat fills up, whichever happens first. Payment at Apoyo Lodge for any additional items (not included in the retreat) can be made in cash (we accept USD, NIO or EUR) or by debit/credit card for a 4% fee. Miriam stumbled upon veganism by chance six years ago, and once she started questioning her food choices, she wasn't able to stop questioning her whole life choices. She left a very successful and stressful career in aviation behind, together with some very poor life habits and some disastrous relationships and embarked on a personal journey to discover some life purpose and reconnect with Mother Nature and ultimately herself. Miriam is now a certified Health and Lifestyle Coach by the Institute of Integrative Nutrition in NYC, who is 37 lbs lighter than she used to be and who has won the battle to many health issues with a balanced and delicious diet, enjoying a lifestyle free of cruelty and respectful to all earthlings and the planet. Miriam now dedicates her time and efforts to help people all over the globe achieve their personal health and lifestyle goals in a sustainable manner through her one-on-one coaching, workshops and retreats. After living in 5 countries across 3 continents, Miriam is now based at Apoyo Lodge full time with her partner Manuel, her step-daughter Yahoska and her rescued four legged companions. You can follow her daily life through her Instagram account or Facebook Page. Looking for a relaxing break away from the Christmas craze? We have something for you. Come to Apoyo Lodge and escape the crowds, the christmas carols, the copious amount of unhealthy food and alcohol and the awkward family reunions. Instead, enjoy daily morning yoga, three healthy plant based meals per day cooked with love (including decadent, yet good-for-you desserts) and plenty of opportunities to relax swimming, reading, hiking, enjoying our holistic therapies or exploring the area as much as you wish. Those who love yoga (or want to try it for the first time!) but also wish to do other activities as part of their vacation. Those who already eat a plant based diet or want to get inspired to do so. Those who might wish to socialize with likeminded individuals at times, but also have flexibility to make their own plans. 7 nights accommodation in your chosen room type. 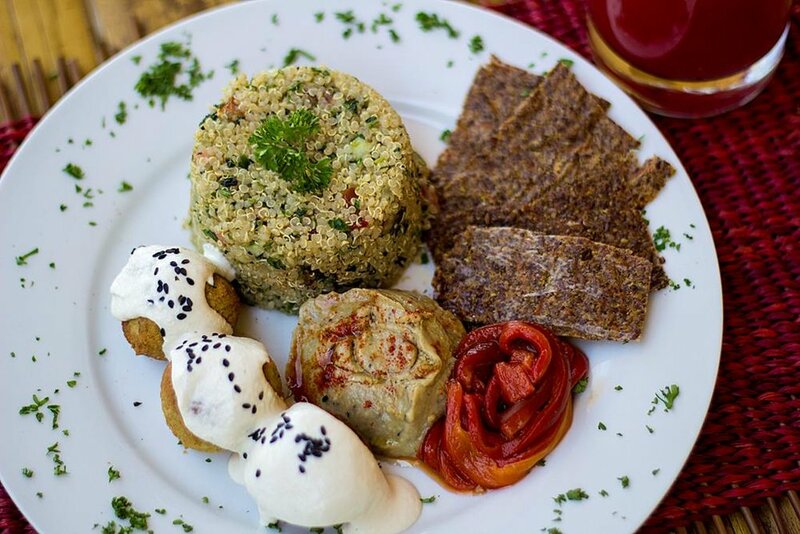 Three plant-based meals per day including a natural drink with every meal and decadent desserts at lunch and dinner. 1 daily morning yoga class. Flights to and from Nicaragua (fly to MGA airport). Additional snacks, juices and smoothies. Massage and holistic therapies (available at extra cost). Health Workshops (available at extra cost). Excursions (available at extra cost). Shared Accommodation starts from - $555 USD per person. Private Accommodation starts from - $815 USD per person. A 50% non-refundable deposit paid by Paypal is required at the time of booking. The remaining balance will be paid by Paypal one week before arrival, or when the retreat is fully booked. Debit/Credit card payments are also available for an additional 4% fee. Lake View Rooms and Suites usually sell out first, book your space early to avoid disappointment! Ready to begin 2020 on a different note? If you are trying to avoid the fuzz around NYE and you are looking to truly start the new cycle with a clean slate, you are coming to the right place. Say hello to 2020 by unplugging from the outside world and connecting with your inner self: relax surrounded by nature and positive vibes while you treat your body to nourishing, healthy meals prepared with love. Start your day with an inspiring yoga practice, read, hike or swim in the clean waters of the volcano crater. You decide how much or how little you want to do during this break. Reflect on the past year and leave the mental junk that no longer serves you behind. Set intentions for the year ahead with the support of our professional, caring team. Get aligned and welcome the new year with a big smile. This package is suitable for single travellers, couples, friends and families alike. Yoga practice level will be adjusted to the group needs. 4 nights accommodation in the room type of your choice. Unlimited wifi (if you wish to!). Shared Accommodation starts from - $345 USD per person. Private Accommodation starts from - $550 USD per person. Join Laura-Beth Power & Gloria Williams for an unforgettable wellness retreat at the beautiful Apoyo Lagoon Natural Reserve in Nicaragua. Apoyo translates to support. This retreat is meant to soothe & support your wellbeing with daily yoga offerings, delicious healthy meals, hiking adventures, relaxation massage, group tour & more! Discover the magic of Nicaragua, known for its jungle-clad beaches, majestic mountains, and volcanic landscapes. 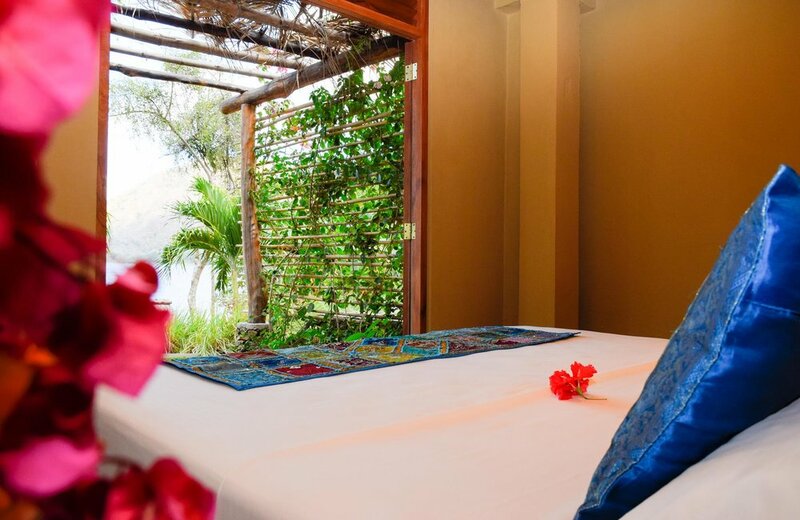 During this trip you will experience the best of Nicaragua by staying at Apoyo Lodge, a truly sustainable health & wellness boutique hotel. 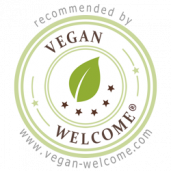 Apoyo Lodge specializes in mindful whole plant based healing cuisine and it is the only 100% vegan hotel in Nicaragua. Enjoy group excursions to explore the beauty of Nicaragua as well as other sources of inspiration such as swimming in the lagoon, stand-up paddle boarding, napping underneath a palm tree, hiking along the greenery, catching up on your reading, or simply connecting with nature once again. Everyone is welcome! Solo travelers, couples, groups, and all levels of yoga experience. Apoyo translates to support, as you embark on this journey with us we will support one another to rediscover our true self. 6 nights accommodation in Apoyo Lodge. 3 nourishing, mindful, whole food plant-based meals per day made with fresh, local organic ingredients (when possible). Unlimited bananas, herbal tea, fresh lime, cucumber and coconut water as well as freshly made juices and smoothies from the Healthy Bar. 2 x yoga classes daily, taught by Laurabeth & Gloria. 1 x 2hr themed workshop. 1/2 day trip to Masaya's Markets and Live Volcano. Natural products (hand soap, shampoo and conditioner made locally) to help you detox your skin during your stay. Daily maid service, 24hrs security, unlimited wifi. Reserve your spot with a non-refundable deposit of $300, (per person) and pay the remaining balance by Nov 15, 2019. Gloria is sole proprietor/director of Soothe Downtown Spa, St. John’s, NL, Canada. Her Ahimsa (do no harm) mission has been moving toward a cruelty-free business / life balance. As such, she participates in ongoing wellness education including environmentally friendly esthetic product / service research, yoga workshops / certifications, enlightenment Intensives & meditation classes and the World Peace Diet; a (vegan) conscious connection with nature and all sentient beings. Chef & Nutrition Training; Gloria is a graduate of Plant Based Nutrition; Cornel (2017) and Heal & Ignite" Raw Vegan Chef Certification (2017) Pachavega. Presently, (2018) Gloria is enjoying Rouxbe Professional Plant-Based Chef Certification Program. Additionally, a hiking enthusiast & travel enthusiast, Gloria's favourite holidays are yoga retreats; you are about to see why they are so ahhh-mazing! Laura-Beth has dedicated herself to the practice, study and teaching of yoga since discovering its joys and benefits in 2004. In 2008 she had a dream of doing yoga on a beach in Thailand. The next day she cleared her schedule booked a flight and backpacked South East Asia for 3 months. It was on a this retreat she decided she wanted to spread the light and begin to teach. Ever since she has been on a life long path seeking truth and inspiring others to awaken to their fullest potential. Este retiro de fin de semana incluye caminatas y meditaciones contemplativas, clases diarias de yoga así como reuniones de grupo al atardecer y/o después de la cena. Está concebido para ofrecer suficiente información e inspiración para la reconexión y la sanación. 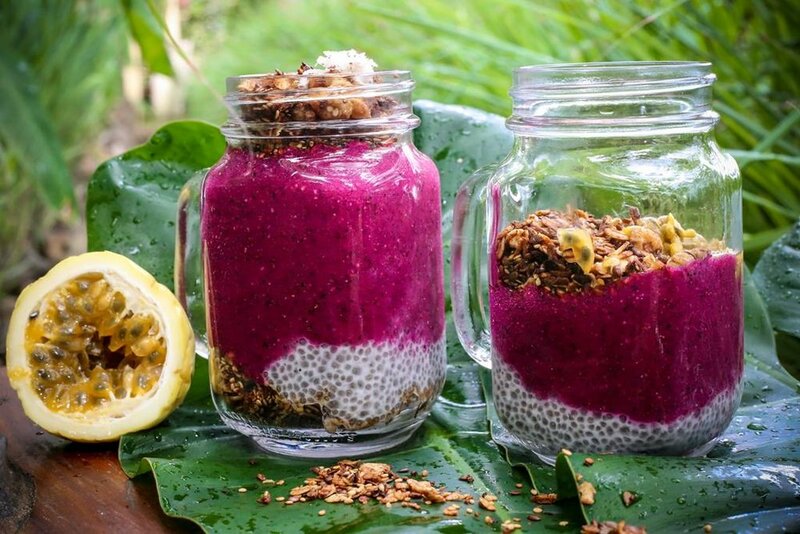 Todas las comidas están incluidas bajo el concepto de menú Detox Vegano (basado en plantas). - Cena compuesta por 3 platos (sopa, un segundo y un postre, incluye una bebida natural). - Desayuno que incluye té y café ilimitado. - Almuerzo completo formado de plato principal, postre y bebida natural. - Agua y te de hierbas ilimitado durante la estancia. - Tres clases de Yoga. - Meditación contemplativa atardecer y amanecer. - Charlas sobre Nutrición basada en Plantas y procesos depurativos. - Charlas sobre Salud y Bienestar. Ximena Gutierrez - Instructora de Yoga, Máster en Alimentación Vegana y Directora de Buen Karma Yoga & Vegan Culinary School Nicaragua. Ximena es instructora de yoga Jivamukti® originalmente certificada de la tradición de yoga Sivananda. Su estilo de impartir clases, combina una inmensa energía con una enseñanza compasiva e inspiradora. En sus seminarios y clases, Ximena incorpora lecciones del yoga para lograr cambios positivos en nuestros hábitos de vida. Ximena aparece en la serie de televisión Aire Yoga , que se difunde diariamente por V-me, la cadena de televisión pública en español de Estados Unidos. Pueden participar niños (mayores de 6 años) costo de $60.00 usd por cada niño. Join Miriam and Shayah, ex-corporate slaves turned health professionals, and enjoy 6 nights in paradise for the body, mind and spiritual reset you know you need. The low energy, the feeling that your to-do list grows uncontrollably, the gym membership you took but you dont have time to use, the will to keep a life-balance and the feeling you are never close enough to it. We know all this. We have lived through it and we came through the other side in one piece. Join us for this unique wellness reboot in which we will take care of you, help you with a few tricks to get aligned at different levels and most importantly, we will hold the space for you to make the most of this well deserved break. This package is perfect for career-focused women in their 20’s, 30’s and 40’s, who are looking for a way to break the cycle in the rat race. Maybe you are unhappy with your weight, maybe you are suffering the consequences of a high stress environment, maybe you don’t even know what you are supposed to eat anymore, and you don’t have the time to figure it out for yourself. No worries, whatever you health needs are, we will most likely be able to help you. We hear you, we see you and we definitely feel you. Accommodation (shared or private) for 6 nights at one of Apoyo Lodge’s boutique rooms. 3 plant-based meals per full retreat day (includes dinner on day of arrival and breakfast on day of departure). Twice daily yoga practice for all levels (judgement-free environment!). 6 Workshops/activities covering themes of nutrition, stress, movement and many others, specifically focused on busy corporate lifestyles. One 60’ massage by Apoyo Lodge’s licensed massage therapist. Unlimited coconut water, herbal tea, drinking water and bananas. Day trip to the colonial city of Granada including SUP Tour of Las Isletas in Lake Nicaragua (suitable for complete beginners!). Visit to Masaya’s live volcano (watch something burn that is not your inbox!). Private airport transfers - no need to wait for the group. Additional snacks, juices, smoothies from the Healthy Bar. Miriam RM is a Health & Lifestyle Coach, 200hr Certified Hatha Yoga Teacher, founder of Retreat with Miriam and Co-Owner of Apoyo Lodge, a health and wellness boutique hotel and Nicaragua’s first 100% vegan hotel. After spending her 20’s and early 30’s overweight, sick and living on adrenaline, Miriam has now found alignment within herself and enjoys helping others find their center and accomplish their personal health goals. Shayah Muller is a Canadian yogi who has been practicing for 10 plus years with a passion for preventative health and wellness. She has completed numerous yoga and meditation teacher trainings and is also a Registered Holistic Nutritionist as well as the founder of Yoga with Shayah. While completing her first yoga teacher training in India, she quickly realized the importance of this ancient wisdom and recognized how badly it’s needed in first world countries with all of our chronic lifestyle diseases. Yoga, travel and transitioning to a plant based diet soon became key factors in her own personal growth and development. After spending years working in administration feeling burnt-out, stressed-out, and unfulfilled, she is now committed full-time to bettering the lives of her students and clients both physically and spiritually, while empowering them to live according to their values and teaching the importance of putting yourself first. She accomplishes this by helping people bring yoga, and its teachings, off the mat and into their daily lives. How about going on vacation and feeling like a million bucks during and after the break? 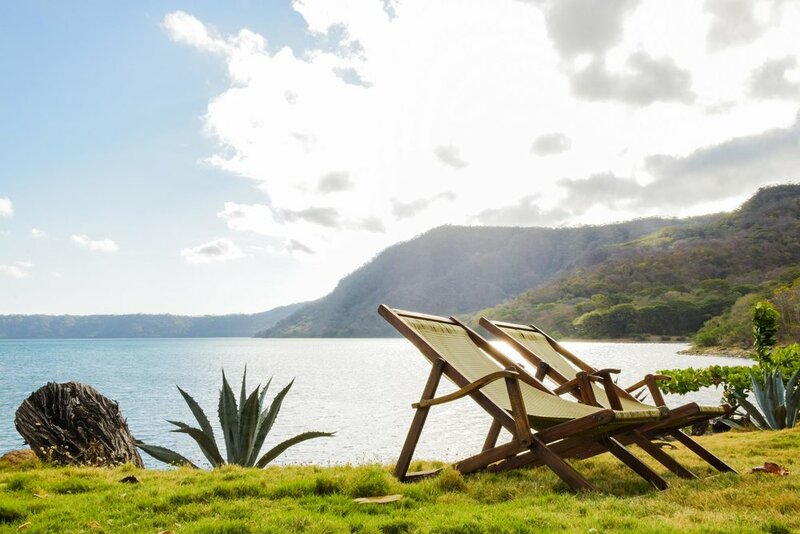 Join Miriam RM, Health and Lifestyle Coach and co-owner of Apoyo Lodge, for a week of relaxation, yoga, nourishing plant-based food, healthy habits workshops and other fun activities in and around the stunning Laguna de Apoyo, Nicaragua. 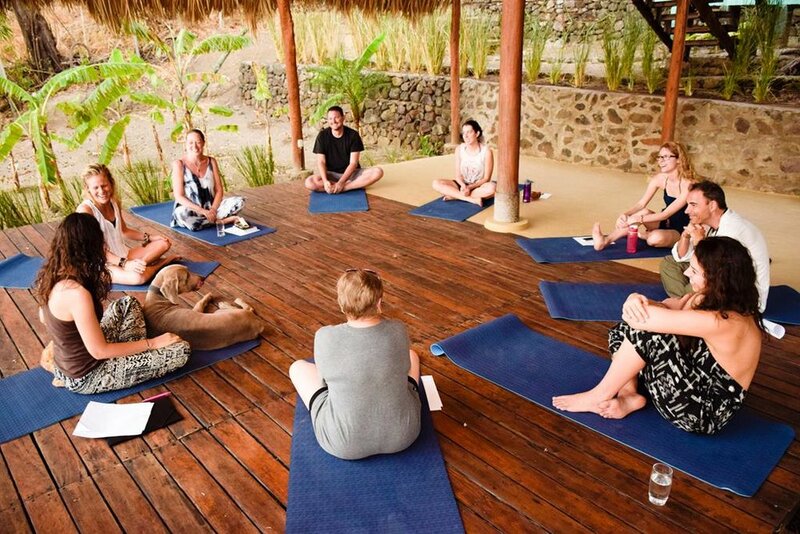 This retreat is the perfect setting for those who want to take a break from a busy lifestyle, reboot their body, reconnect with their inner selves, learn how to jump start or sustain a healthy lifestyle, all while being surrounded by a tropical dry forest and the pristine and healing waters of the beautiful crater lagoon. There is space for couples, friends and single travellers of all ages. Whether you prefer to stay still or go out seeking adventure, there is something for everybody. This is a healthy, "feel good", all-inclusive vacation that gives you the opportunity to experience new things: from learning about plant-based nutrition to taking a peek inside an active volcano and exploring Las Isletas in Lake Nicaragua by SUP. It is also an opportunity to connect with like-minded individuals who, like you, care for the wellbeing of humans, animals and the planet. On its third edition already, Healthy Living with Miriam is the retreat for those who don't go on retreats (until now, that is!). 7 nights shared/private accommodation in one of our Lake View Suites, Lake View Rooms or Forest Rooms with private bathrooms and hot water. Three plant-based meals daily - menu designed to inspire you to get in the kitchen when you get back home. Unlimited herbal tea, lime water and fresh coconut water. Daily morning yoga and meditation class - explore different types of yoga each day to give you a chance to taste all the goodness that comes from this practice. Healthy Living Workshops - topics such as nutrition, exercise, relationships, career, spirituality will be covered in a fun, informational and laid back way. Day trip to the colonial city of Granada including a SUP (Stand Up Paddle Board) Tour around Las Isletas in Lake Nicaragua. Dance and Acro Yoga Workshops. 1 x 60' Deep Tissue or Relaxing massage. 45 mins Health Consultation with Miriam. Included in your accommodation cost: All natural, chemical-free toiletry products (hand soap, gel, shampoo and conditioner made locally), hot water, daily maid service and unlimited wifi. Flights to and from Nicaragua. Additional snacks not mentioned above. Additional excursions or services not mentioned above. Miriam stumbled upon veganism by chance almost 6 years ago, and once she started questioning her food choices, she wasn't able to stop questioning her whole life choices. She left a very successful and stressful career in aviation behind (together with some very poor life habits and some disastrous relationships) and embarked on a personal journey to discover some life purpose and reconnect with Mother Nature. Fast forward four years and you find a certified Health and Lifestyle Coach, who is 37lbs lighter and has won the battle to many health issues with a balanced and delicious diet, enjoying a lifestyle free of cruelty and respectful to all earthlings and the planet. After living in 5 countries across 3 continents, Miriam now dedicates her time and efforts to help people all over the globe achieve their personal health and lifestyle goals in a sustainable manner through her one-on-one coaching, workshops and retreats: Spring Detox Camp and Healthy Living with Miriam. 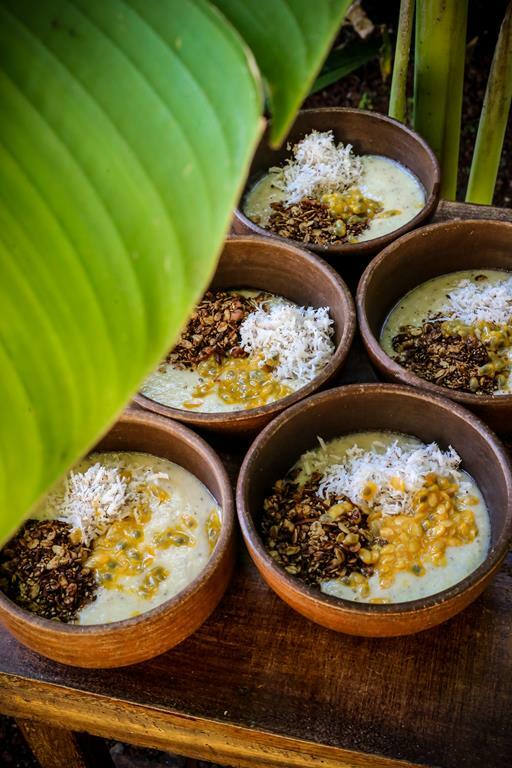 In 2016, together with her good friend and business partner Maribel, Miriam opened Apoyo Lodge, a health and wellness boutique eco-hotel, and Nicaragua's first 100% vegan resort. 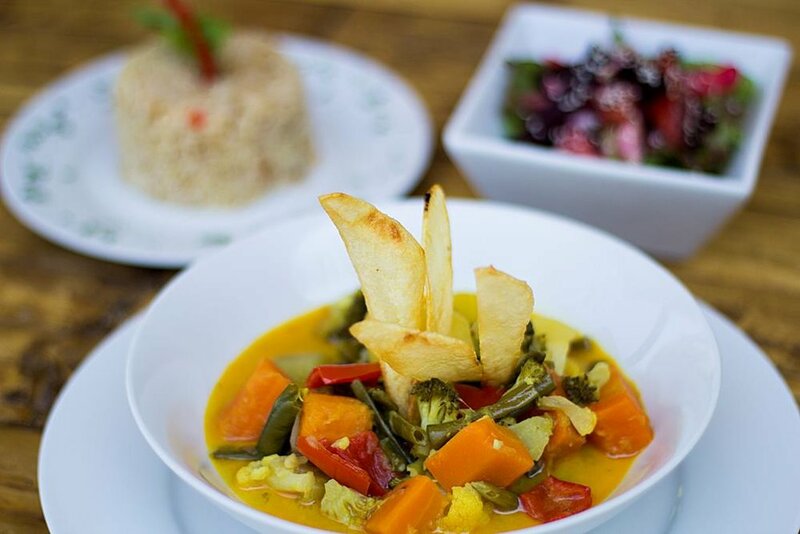 Apoyo Lodge was created as a sacred space where humans, animals and Mother Earth can thrive in harmony, and to bring healthier plant based options to the Central American scene. Miriam lives full time at Apoyo Lodge with her partner Manuel, her step-daughter Yahoska, and a bunch of rescued animals. An agent of change. In the midst of a very chaotic yet lucrative, successful yet stressful career in travel nursing: life came to a screeching halt for Joanna. Something so painful and downright scary made her slow down. Way down. Earth-shattering news that had her questioning every corner and detail of her life, especially its authenticity. This external and internal struggle led Joanna directly to her yoga mat, where she had previously learned how to let go, find and bring light into difficult situations such as depression, anxiety, an eating disorder, the constant need and obsession for perfection, "failed" relationships, to name a few. Yoga has impacted Joanna in an infinite amount of ways and what began 6 years ago with the intent of becoming physically strong, later became an unexpected, life-changing, spiritual journey and now a way of life. With the support, encouragement, and guidance of her mentors, Joanna took the opportunity to complete a 200-hour yoga teacher training in Ubud (Bali, Indonesia) with Zuna Yoga. The Zuna Yoga philosophy and methodology of asana, Pranayama, meditation, and Ayurveda have led Joanna to the discovery of the most authentic version of herself. She now assists others in discovering their most authentic and auspicious version of themselves. Joanna has been working as a holistic nurse coach by creatively & scientifically designing individualized health and wellness routines for her private clients. This method is proven to be a much more cost-effective soul-ution, rather than the typical treatment of diseases such as osteoarthritis, cancer, diabetes, multiple sclerosis, high blood pressure, high cholesterol and even depression. Joanna is an advocate for cultivating wellness from the inside out, as she believes it is the future of healthcare and the world we live in. Join Souljourn Yoga Foundation founder, Jordan Ashley, Alison Riazi, and Alma Retreats for a nourishing yoga retreat all in the spirit of supporting UPNicaragua, a non-profit social enterprise focused on the empowerment of young girls in Granada, Nicaragua. UPN was founded in 2015 with the goal to create education and mentorship opportunities for vulnerable girls living in the tourist-booming city of Granada. Our adventure will take place from January 14-20 that will be both relaxing and empowering as our journey will be focused on giving back to girls’ education through our time spent at UPNicaragua. We begin our retreat with 3 nights of beachside lodging at the gorgeous Tres Volcanes Ocean Villa. 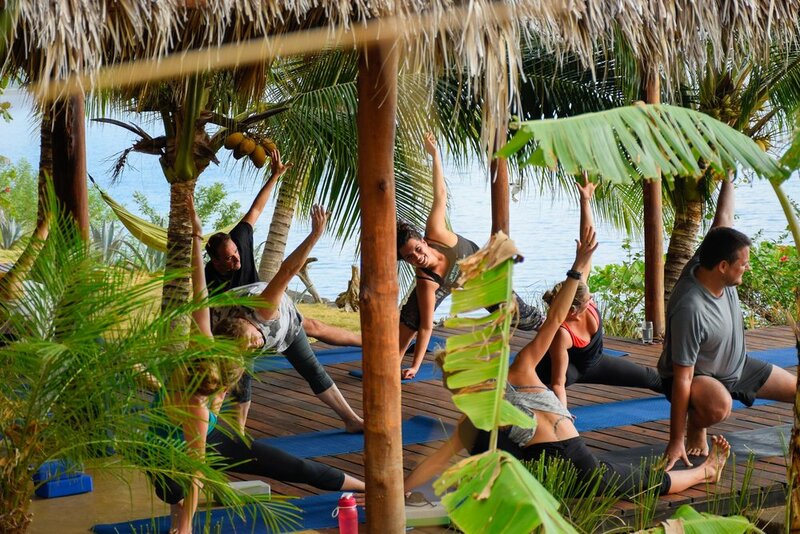 We will then spend the day in Granada with a morning and afternoon session at UPNicaragua followed by 2 nights at the stunning lakeside yoga shala, Apoyo Lodge. Our trip will culminate on the back of a pick up truck journeying through coffee country. Included in the tuition to attend is a $300 tax-deductible donation to UPNicaragua. Additional excursions or activities: Surf Lessons, Surfboard Rentals, Massage, Horseback Riding, Boat Rentals, Private Yoga Lessons available at the different locations. Email Stacey Clark at Alma Retreats (almaretreatsnica@gmail.com) for more information on availability and rates. Souljourn Yoga is an organization inspired by seva, the sanskrit word and yogic principle of selfless service. Our aim is to raise awareness and funds for girls education in developing countries by teaming up with both local and international non-profits. We create opportunities to explore, practice, and educate through yoga both on and off of the mat by offering a spectrum of workshops and global retreats to continue to promote female empowerment and education to communities where equal opportunities aren't always readily available. As a free flowing mover and modern dancer, Vinyasa flow classes have drawn me deeper into my personal practice and influenced my teaching style. My dance background helped me to create interesting and original sequencing, which allows me to provide an open space for my students to move like themselves. I am a hands-on instructor and offer gentle assists and adjustments for my students, which not only helps to prevent injuries, but can transcend the power of healing for stress, overwork, and anxiety. Musicality and the power of chant play an important role in my classes. I am trained in life balance consultation (Ayurveda) and massage therapy, which I offer upon request. I aspire to create a warm, welcoming, and fun experience for my students to learn more about themselves, to dive deeper into their practice, and to trust in the unknown. I received my 200 hour certification through CorePower Yoga in Chicago in 2009 and my 500 hour certification at Laughing Lotus NYC in 2013. My inspiration comes from everyday life, nature, the ability to let go, fearlessness, acts of love and kindness, and the balancing act we call life. While I've studied under amazing and inspiring yogi's, my teachers come in all different forms of humanity. Alma Retreats is a culturally inspired yoga retreat and tour operator that provides an opportunity to practice in a lush forest of Nicaragua, relax on isolated beaches with a fresh fruit smoothie in hand, feel the salty air on your skin and travel through coffee country meeting the farmers behind the beans as well as an experience that will spark something inside and fill your soul on the mat and off. Alma retreats offers retreats and something more. We are a collaboration of teachers, healers, nurterers and creators committed to a practice of open heartedness, gratitude, and self discovery and believe in local relationships and ethical travel. In addition to a week long escape of sunshine and waves, our retreats provide a source of income for El Libro Volador, a library bus project that brings books and resources to remote communities in the highlands. On the last day of each retreat, we leave the hammocks and yoga mats behind for a day in these communities, starting with waterfalls and ending with an afternoon with a local family, an experience that is both magical and unique. From start to finish, our retreats will change you. Join us and see for yourself! Visit Alma Retreats for further details and contact Stacey Clark to book now.